Lady Astor, if you were my wife, I'd drink it. He is a sheep in wolf's clothing. He is a modest little man with much to be modest about. And you, madam, are ugly. But I shall be sober in the morning. There is nothing quite so exhilarating than having been shot at, and survived. He can be described as one of those orators who, before he gets up, does not know what he is going to say; when he is speaking, does not know whast he is saying; and when he has sat down, does not know what he has said. What you should have done, is put your speech into the fire. First you read the speech. Secondly, you read it badly. Finally, it wasn't a speech worth reading. - in reply to a young member of Parliament who asked Churchill what he thought of a speech that the MP had just delivered. There are 3 things I like about being on an Italian cruise ship. First, their cuisine is unsurpassed. Second, their service is superb. And then, in time of emergency, there is none of this nonsense about women and children first. Too many passives and too many zeds. Too many Latinate polysyllablics like 'systematize, prioritize, and finalize'. What if I had said - instead of 'We shall fight on the beaches' - 'Hostilities will be engaged with our adversaries on the coastal perimeter'? - When Churchill was asked to comment on a report. Let us have an end of such phrases as these: "It is also of importance to bear in mind the following considerations..." or "Consideration whould be given to the possibility of carrying into effect..." Most of these wooly phrases are mere padding, which can be left out altogether or replaced by a single word. I have no patience with people who are always raising difficulties. Let there be sunshine on both sides of the Iron Curtain; and if ever the sunshine should be equal on both sides, the Curtain will be no more. It's no use to argue with a Communist, or to try to convert him or persuade him - you can only do it by having a superior force on your side on the matter in question. Trial by jury, the right of every man to be judged by his equals, is among the most precious gifts that England has bequeathed to America. Victory will never be found by taking the line of least resistance. It always looks so easy to solve problems by taking the path of least resistance. What looks like the easy road turns out to be the hardest and most cruel. To look is one thing, to see what you look at is another, to understand what you see is a third, to learn what you understand is still something else, to act on what you learn is all that really matters. Wealth, taste and leisure can bring many things, but they do not bring happiness. 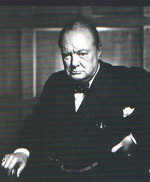 Editor's note: Of course, Winston Churchill had many more memorable quotations, especially during the Battle of Britain, when he used words to rally the British people. Those very well-known quotations are not reprinted here, because they are already so well-known. We have tried to include quotations are maybe are not as well-known but equally memorable and perceptive and incisive in its wording.